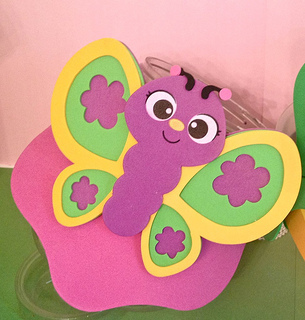 Looking for butterfly party ideas? With colorful wings and foam butterfly visors, my girls were not quite flying, but surely fluttering around all afternoon. This girl pool party theme starts with the invites and carries right through to the party bags. 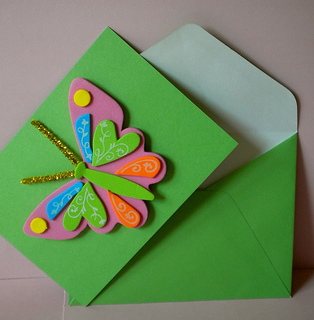 Choose a color combination and repeat it in the invites, paper goods, decorations and party bags. A pink and lime green color scheme works well and provides lots of color to this party theme. Hang and make pink tissue paper flowers . Hang them from the patio table umbrella, tree branches or garden arbor. I bought a large box of stock paper and envelopes from Target that had a variety of colors. I use them all the time for our pool party invites. Print out the details of the party and then glue them to the backside using a glue stick. 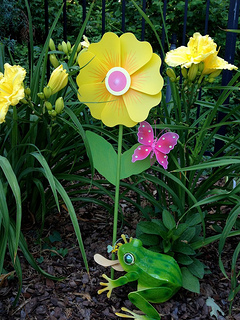 Use fun wording like "Flutter over to the Miller's garden for Amy's birthday celebration." 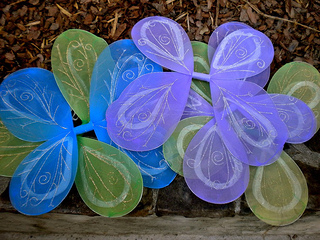 I found lots of inexpensive gossamer butterflies at our local dollar store and Hobby Lobby. Put them low hanging tree branches and on shrubs that line the pathway to the party. A beautiful pink and green linen tablecloth adds a great touch to the party table. Duplicate your party colors in your party bags. I love these bright lime green bags. Attached a pink butterfly on the bag and one on the handle. Insert vivid pink tissue paper and a couple of colorful, shimmering stems. 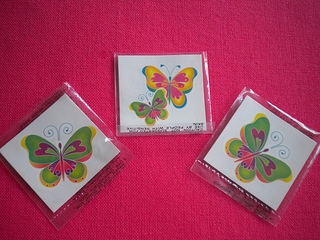 Rings, necklaces, and hair clips with butterflies on them went into the party bags along with temporary tattoos. (As a registered nurse, I am not a fan of sugar so I keep candy out of the bags). Get lots of wings from your favorite dollar store. 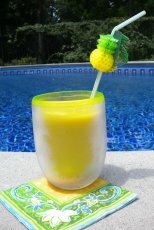 Hang them on the pool gate, tie them onto the patio umbrella pole or put one on the birthday girls' chair to make it special. Set them out near the party area so that each guest can pick their own. Buy extras for decorating. Besides lots of wings, use flower pinwheels to decorate around the party area. The pinwheels twirled in the wind and added a great spot of color and decoration. I found mine at Hobby Lobby and snatched up a bunch of them at the end of the summer on clearance. Gossamer butterflies are found on tree branches, shrubs, and the party table. Always start your butterfly decorations outside. 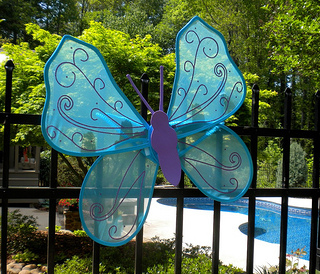 The pool gate is adorned with butterfly wings and a cut-out foam body. Tie wings with some colorful netting to the party chairs. Use an assortment of colors. We decided to do just one chair for the birthday girl. I found these flower pinwheels at Hobby Lobby the end of the season and bought a whole bunch. They were placed along the pathway leading to the pool area. 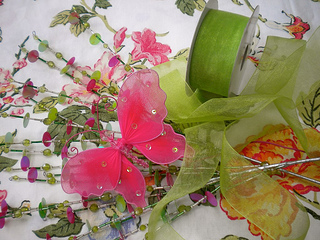 Attach a gossamer butterfly to the flowers. They looked so cute and fun as the wind kept them spinning the whole afternoon. 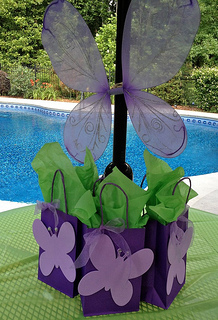 More often than not, the party bags do double duty as centerpieces as our pool parties. They fit nicely around the patio umbrella pole. 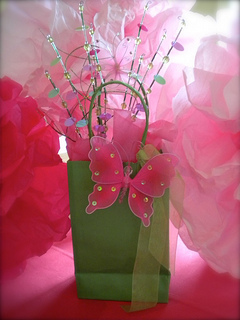 Solid color bags with a foam butterfly glued onto it made this decoration inexpensive and simple to do. Attach one of your extra wings to the pole using a large twist tie. 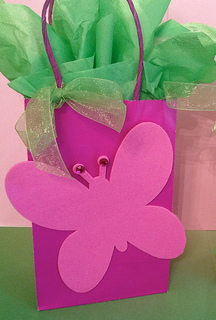 Use large foam butterfly shapes to decorate the party bags. 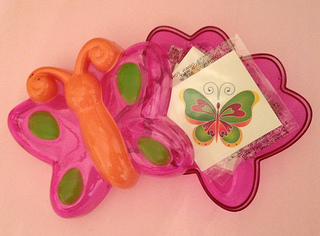 Pink jewels are glued to the butterfly and then using a glue stick glue the foam shape onto a solid color party bag. Bright lime green tissue paper complemented the green. 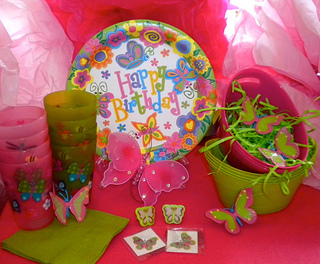 Pick a color combination for your party and repeat it in the paper goods, party supplies, invites and decorations. I love the simplicity of the bag - affordable, easy to make, but colorful and appealing to the guests. Provide wings at the beginning of the party. Let the girls wear them during the scavenger hunt, the Butterfly parade and of course pictures. Take them off during swim time but let each girl take her pair of wings home with her. 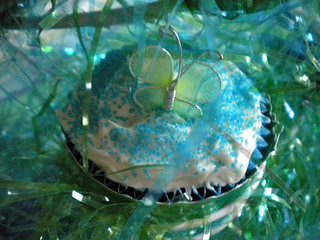 A cake (or cupcake) decorator I am not, but that doesn't mean our butterfly cupcakes are anything but fun and creative. These plastic toys were found at Target in the toy section. Besides, kids like cupcake toppers they can play with better than a beautifully frosted one. Use pink cupcake wrappers They add great color. Most cupcake liners look good before the cupcakes are baked but the oil usually fades any color and design making them useless. 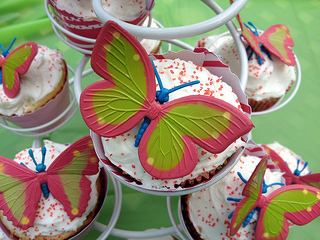 Top the cupcakes with these tiny store bought butterflies. The ones in the picture came in a large quantity from Amazon. Or use plastic toy ones. For a warm outdoor party, I found that store bought frosting holds up better than homemade. 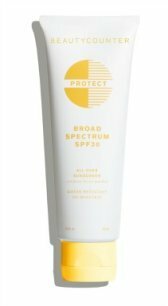 It doesn't melt and stays more firm. Duncan Hines is my favorite. 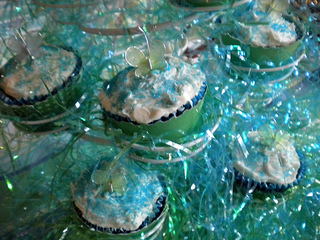 For this butterfly birthday party, we used blue and green sparkling Easter grass on just about everything, including in and around the cupcake stand. Sprinkle colored sugar on top for a decorative touch. Before everybody hops into the pool start with a Butterfly Parade. 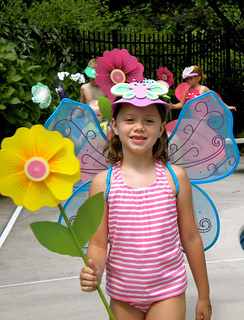 Provide each guest with a set of wings, a foam visor and a pinwheel flower or a wand. Our guests paraded to the song, "Bullfrogs and Butterflies" but another great song would be "Fly to My Heart" by Selena Gomez. Thinking about our Butterfly Parade, scavenger hunt, and dive game for butterfly rings still brings a big smile to my face. If you are looking for a girl pool party, this is a great one. 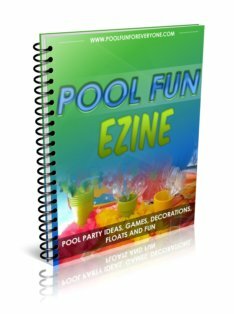 Pool party games take on a whole new excitement and creativity when there is a theme. 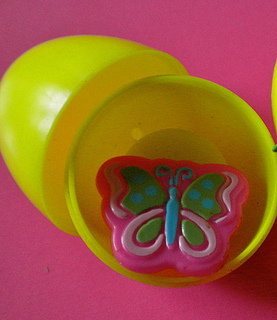 We didn't just dive for dive rings - instead butterfly toys fluttered to the bottom of the pool. A scavenger hunt around the perimeter of the pool found some exciting treasures. These Butterfly Foam Visors are well made. They stood up to lots of fun playing in and out of the pool. Set up a tattoo station - have the girls find their tattoos first during the scavenger hunt. Have the girls bring their tattoos to the set up station which requires a bowl of water and a wash cloth. Let each one decide where to put the tattoos. Surprisingly they are pretty waterproof and stay on even through an afternoon in the pool. You can get this same set of tattoos at Amazon with free shipping if you are a Prime Member. Use the extra tattoos for the party bags. 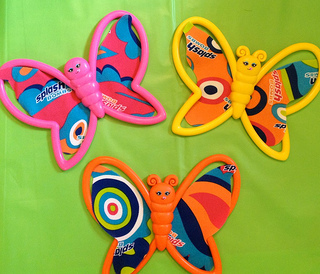 These brightly colored inflatable butterflies can be used to decorate the pool and for some fun games. At 27" across they are a nice size. Everyone loves a scavenger hunt. Place some little trinket, like these tattoos in a butterfly shaped container and hide them in the yard or around the pool. Where would we be without our yellow dive eggs for our pool party games. Just change up what is put inside and you have some motivated divers. Throw the eggs to a depth that is comfortable for your swimmers. 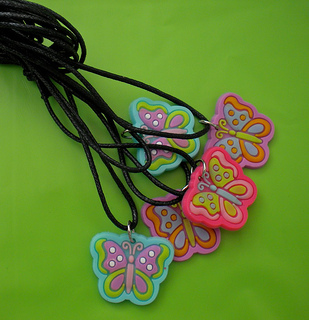 What could be more perfect than these rubber butterfly rubber rings ? One at a time have the kids dive to the bottom of the pool to get one egg. Each guest gets to keep the ring, but oh, no not the dive eggs. We just simply tossed them into the pool and gave each guest a turn to gather one or all of three of them in one breath. 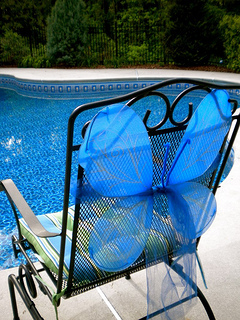 Keep your guests in flight with these butterfly party ideas and build a special memory of fun times at your pool.